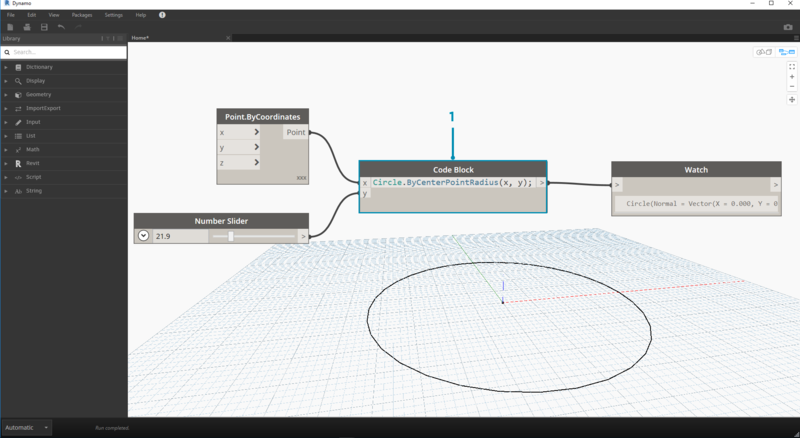 The Dynamo Library contains the Nodes we add to the Workspace to define Visual Programs for execution. In the Library, we can search for or browse to Nodes. The Nodes contained here - the basic Nodes installed, Custom Nodes we define, and Nodes from the Package Manager that we add to Dynamo - are organized hierachically by category. Let&apos;s review this organization and explore the key Nodes we will use frequently. The Dynamo Library that we interface with in the application is actually a collection of functional libraries, each containing Nodes grouped by Category. While this may seem obtuse at first, it is a flexible framework for organizing the Nodes that come with the default installation of Dynamo - and it&apos;s even better down the road when we start extending this base functionality with Custom Nodes and additional Packages. 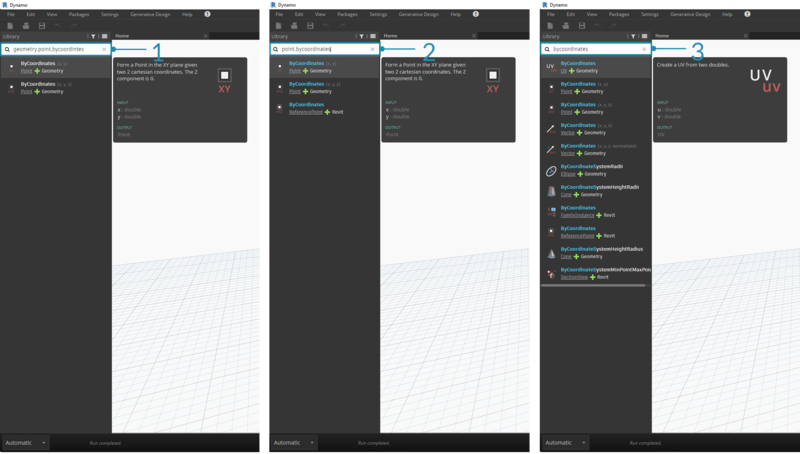 The Library section of the Dynamo UI is composed of hierarchically organized libraries. As we drill down into the Library, we are sequentially browsing a library, the library&apos;s categories, and the category&apos;s sub-categories to find the Node. The hierarchy of each library is reflected in the Name of Nodes added to the Workspace, which we can also use in the Search Field or with Code Blocks (which use the Dynamo textual language). Beyond using key words to try to find Nodes, we can type the hierarchy separated with a period. 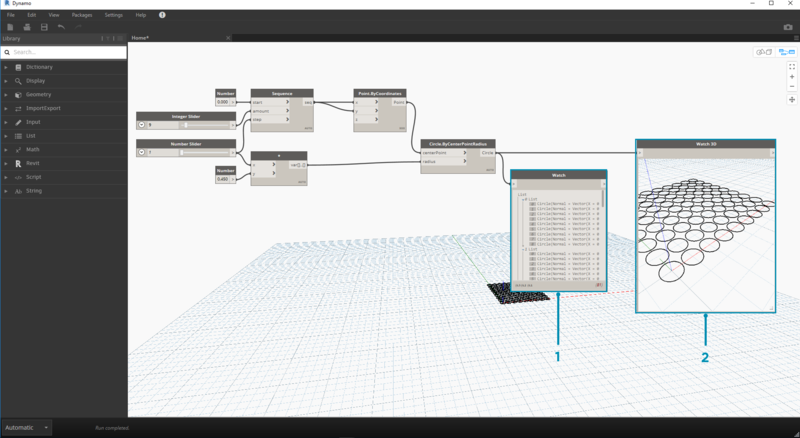 With hundreds of Nodes included in the basic installation of Dynamo, which ones are essential for developing our Visual Programs? Let&apos;s focus on those that let us define our program&apos;s parameters (Input), see the results of a Node&apos;s action (Watch), and define inputs or functionality by way of a shortcut (Code Block). The Watch Nodes are essential to managing the data that is flowing through your Visual Program. While you can view the result of a Node through the Node data preview, you may want to keep it revealed in a Watch Node or see the geometry results through a Watch3D Node. Both of these are found in the View Category in the Core Library. Tip: Occasionally the 3D Preview can be distracting when your Visual Program contains a lot of Nodes. 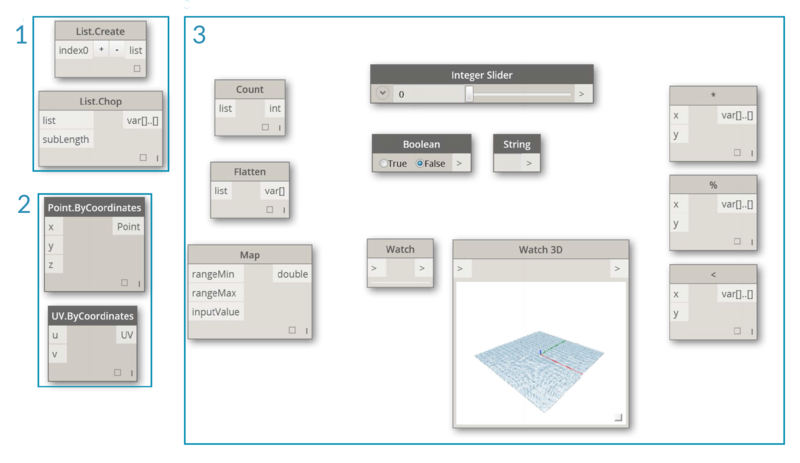 Consider unchecking the Showing Background Preview option in the Settings Menu and using a Watch3D Node to preview your geometry.